So in between seeing the amazing sites of Paris, you must wine and dine yourself. French cuisine is absolutely one of my favorites. High quality ingredients, magical flavors and extremely reasonably priced wines make your mouth water on a daily basis here. Although there are many places in Paris where you get beautifully plated food that looks like it belongs in an art gallery as opposed to your plate and the prices make your wallet ache a little, there are plenty of places with regional dishes with a more rustic style. These small restaurants and bistros are my real favorites. Food is affordable, but tastes great! One thing I want to mention about eating in France is that the word entree is not used the same way it is used in the United States. Entree signifies a first course or appetizer in French, whereas in American English, we often use it to signify the main course. So just remember that when you are looking at the entree section of the menu. Another interesting things you will quickly discover that the best part of Europe is that wine is cheaper than water. We had this bottle for about $20 US, so it is definitely fun to order the delicious wines of France. I love the handwritten menus at many of the bistros and cafes featuring the chefs daily specials. There are often some great things on there, so always ask the server to help you translate it for you, they were always most happy to do so when I asked. We had the best French Onion Soup ever while we were in Paris, the broth was really incredible rich. 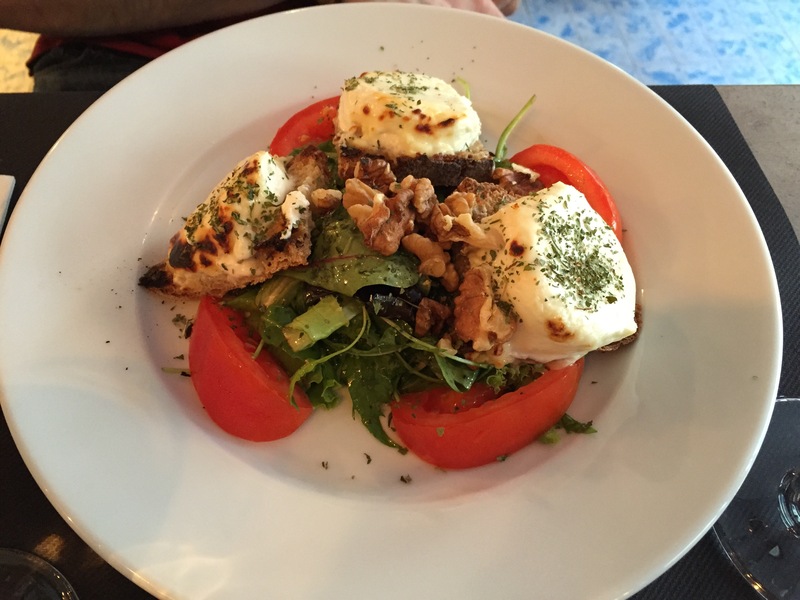 It was at Le Bistro du Perigord (I’ll include the address at the end of this post. The restaurant is a small family run restaurant and offers an incredible 3 course menu for 36 euros!). Don’t forget to try some escargot, I mean when in Rome….I mean Paris, do as the Parisians would do! Escargot is french for snail, and is a very popular starter. It is most commonly cooked with garlic, butter and parsley. I really enjoy this dish, but keep in mind that it is really chewy. That can definitely be a problem for some, but if you can get over that you’re eating snails, you should definitely give it a go. Another delicious starter is Fois gras, which is made with the liver of a duck or goose that has been specially fattened. The Fois gras here was pan seared and served with an espresso sauce. It was extremely tasty with the crusty baguette we were given. As I mentioned before, I love the freshness of the French ingredients. Here is a charred goat cheese salad, and everything had bright natural flavors. It was excellent. So on to the main dishes. 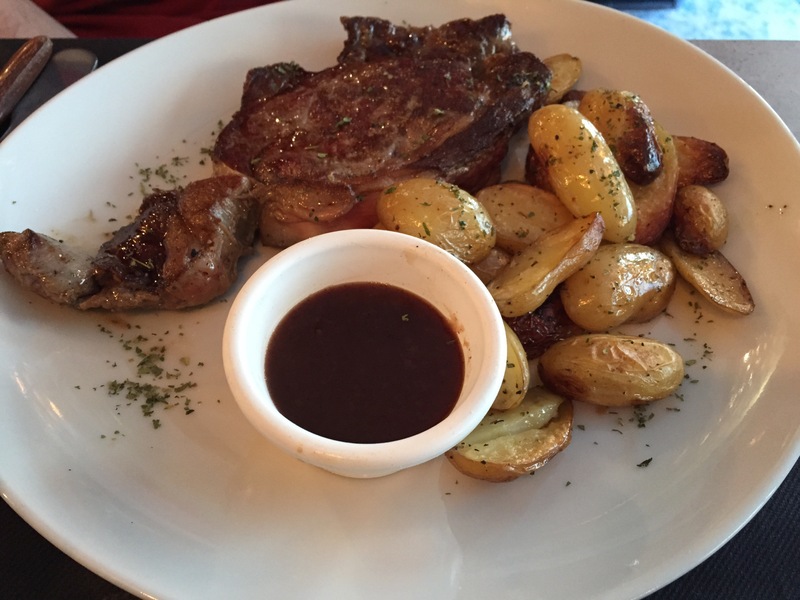 Steak Frites (which you will see in many restaurants), is comprised of an entrecôte (also known as rib eye) and is served with potatoes (often french fries, but it can also be oven roasted). This is almost always a delicious and filling meal in my opinion. You will also find Steak Frites served with a sauce, in this case there was a mushroom sauce. We we have also had it with a black peppercorn sauce which is always a winner. You will find a ton of duck dishes all over Paris, I definitely saw more duck items than chicken. The bright side of that is that duck is so delicious! You can try dishes such as: Duck a l’orange, Duck confit, and Magret de Canard (Seared Duck breast) to name a few. 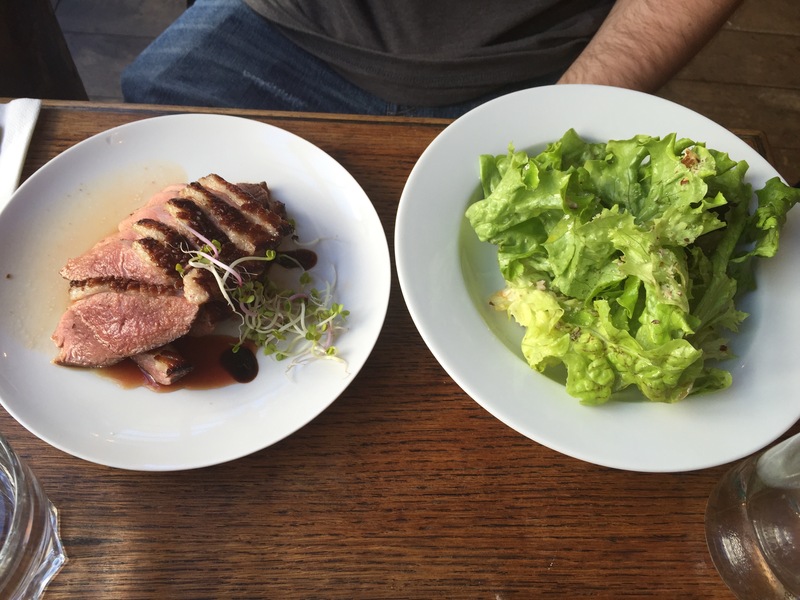 This was a seared duck breast with balsamic reduction and a light side salad. This is Duck confit, and my favorite thing about this dish is that it is so flavorful and the duck is fall off the bone tender. 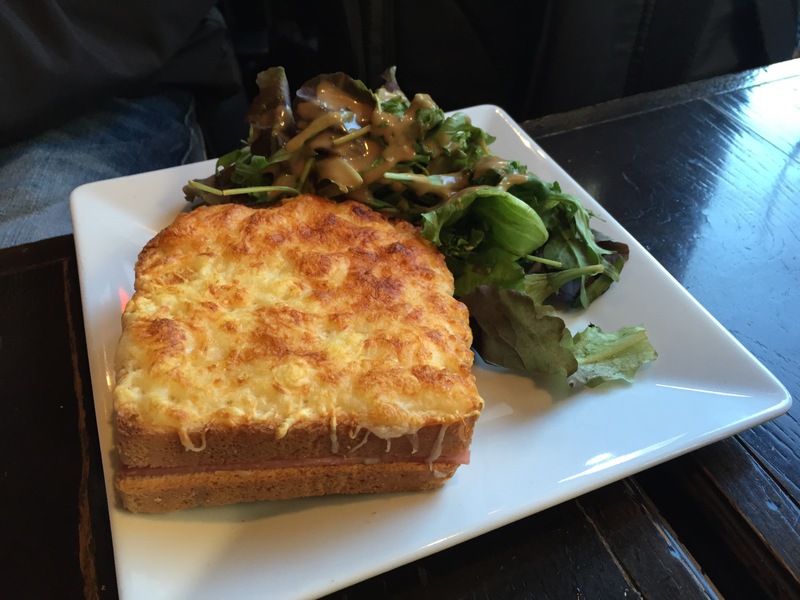 For something quick and simple you can’t beat the Croque Monsier. The Croque Monsier is a sandwich that contains ham and is topped with cheese and the whole sandwich is baked or pan fried. If you want something even more, you can try the Croque Madame, which is the same thing with the addition of a fried egg on top! Here are some other French classics. Roasted chicken, or in this case roasted guinea fowl alongside mashed cauliflower. And don’t underestimate the beautifully crafted burgers. So full of flavor and really meaty! Finally, I can’t emphasize this enough, SAVE ROOM FOR DESSERT! You’ll be sorry if you don’t. 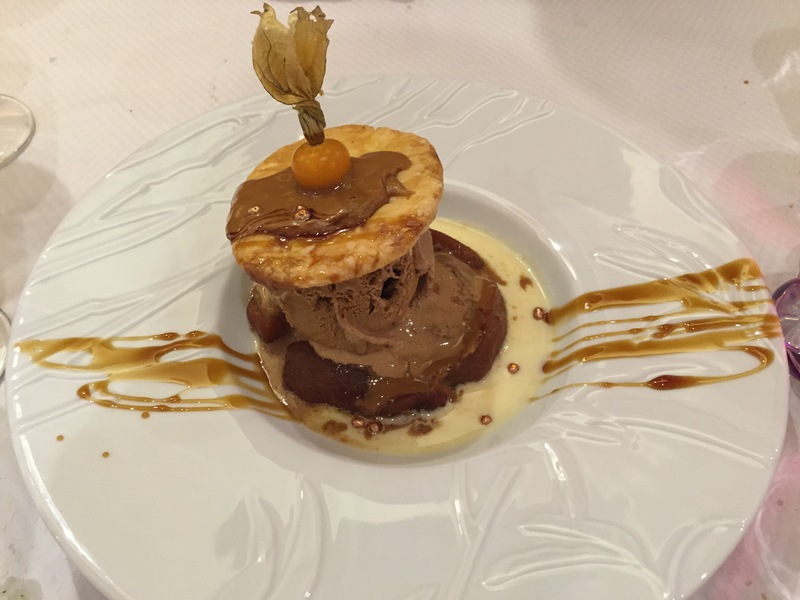 Here is the Apple Millfeulle dessert we had at Le Bistro du Perigord. I cannot begin to tell you how delicious this was. The layers were flakey, the ice cream was amazing, the caramel was perfect and the flavors were definitely a harmonious combination. I still dream of this dessert. 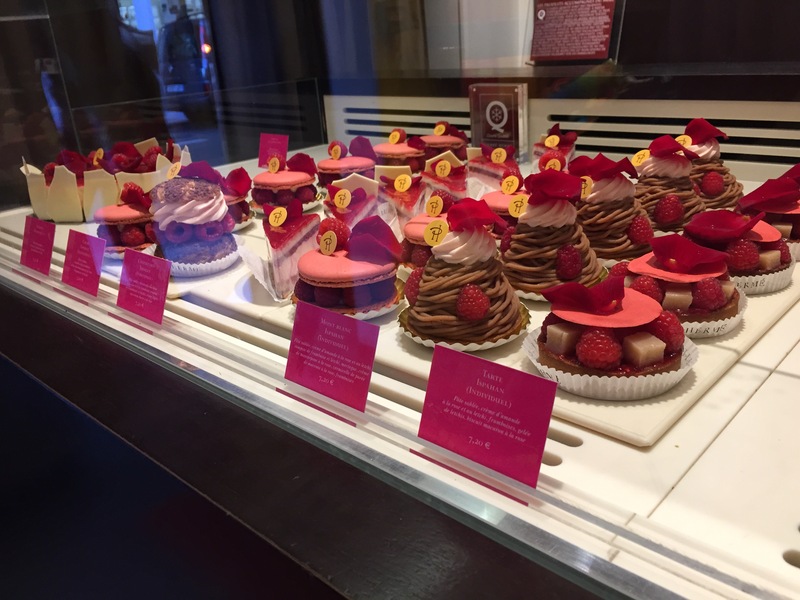 If you don’t have dessert during mealtime, don’t panic, there are plenty of bakeries with sweets to be had. Here are some of the items at Pierre Hermes. 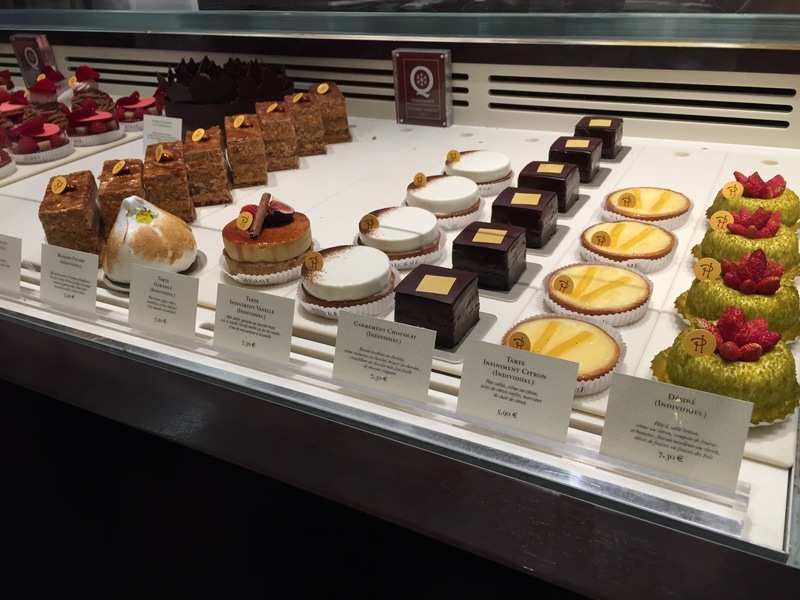 Pierre Herme is well known for their beautifully crafted desserts and they unique flavors. 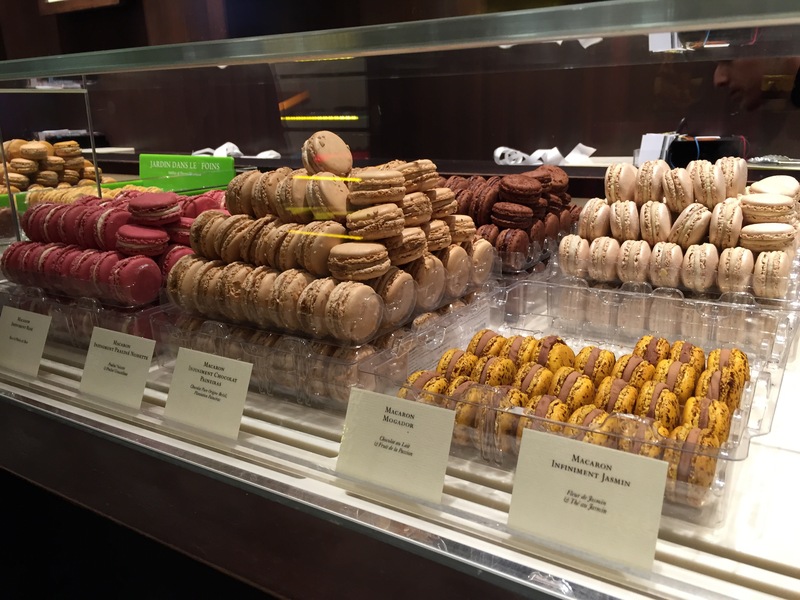 We purchased quite a few macarons from them. They have amazing flavors like Passion Fruit and chocolate, Jasmine Tea, and more. Overall, Parisian food is heavenly. It’s a wonder that Scott and I were able to still fit in our clothes when we got home. So when you go to Paris make sure you walk a lot, eat a lot, and just soak up the wonderful French culture. You won’t regret it! Here are 2 restaurants we really enjoyed, they were both fabulous and we had a great dinner. I would definitely recommend making reservations if you can.